Here are two cool recipes for refreshing summer Holiday Appetizers. Either of these recipes will be perfect for any warm weather day, 4th of July weekend event, or annual food festival. 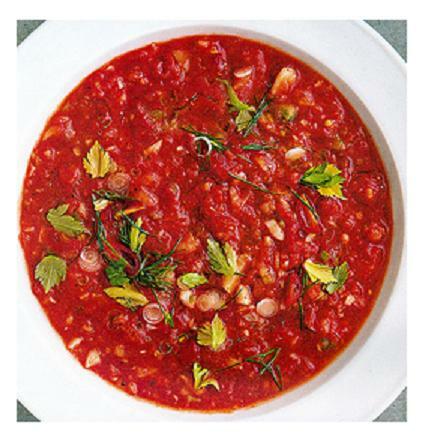 Gazpacho is a cold, tomato based, raw vegetable soup that originated in southern Spain. In a blender or food processor, combine all ingredients, except cilantro. Blend to a slightly chunky consistency. Sprinkle each serving with fresh, finely chopped cilantro. 1. In a medium saucepan, gently sautee the chopped leek and the chopped onion in butter or margarine until they are soft, about five to eight minutes. Remove them from the heat BEFORE they begin to brown. 2. Add the finely sliced potatoes and chicken stock to the saucepan. Add Salt and pepper as desired. 3. Bring the ingredients to a gradual boil. Then reduce the heat and let the soup simmer for about half an hour. 3. Puree the heated mixture in a blender or food processor, until the consistency is very smooth. 4. Let the mixture cool. 5. Gently stir in the cream just before serving. SERVING SUGGESTION: Sprinkle the top of each serving very lightly with leeks, parsley, pepper, or even a small pinch of curry powder.